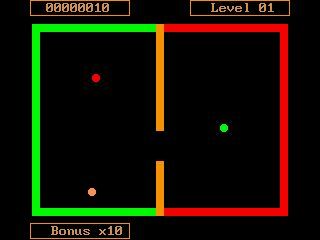 LapiGP is a remake of a freeware game called Lï¿½pi (Laepi) originally written by D.Pavlovsky (1985). I played this game on my 286 years ago, so I decided to make a GP32 version. Because I don’t have the original’s source, I wrote a new GP32 version and extended it with some features. Just put the LAPIGP.FXE and the LAPIGP folder in your GPMM folder. For WindUps there is an lapiicon.gif in the LAPIGP folder. The goal of this game is to sort all green balls in the left green area and all red balls in the opposite red area. The position of the yellow ball is not important. You can move the bar in the middle by pressing UP/DOWN or A/B. The bar will keep moving until it reaches the top or bottom. Everytime the yellow ball crosses the hole in the bar, you get 10 points. When all balls are sorted, you will recieve a bonus depending on how fast you completed the level. Pressing the START button will stop the game and the menu will be shown again. L+R will reset your GP32. In the menu you can choose between three game modes. “Normal Game” will start a game of 9 levels with increasing dificulty. Level parameters will change every level. The game will end after 9 levels. “Freestyle” will let you set up the level parameters. “Random Game” creates a new random level every time you finish a level. Choose a menu entry with UP/DOWN. Press A/B to select or change the menu entry.